Keith, a representative working on behalf of Bavarian Almond Shoppe, contacted us Tuesday this week in desparate need of some help to get a website finished up. Keith was building a website for Bavarian Almond Shoppe and the owner was scheduled to drive a few hours to meet him on Thursday (yesterday) to see the completed website and go over how to manage it. Unfortunately, Keith was having some issues with several aspects of the website and needed to have the items fixed quickly. The majority of all the requested changes were done within an hour or two from our phone coversation while the payment gateway took a little bit of investigative work to get fully configured and tested. In the end, Keith was very happy with our response and how quickly we got things done on the website. 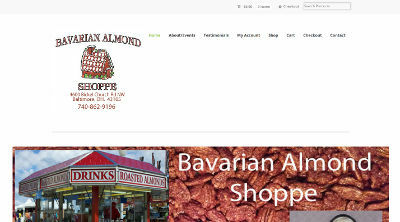 Bavarian Almond Shoppe’s website is at bavarianalmondshoppe.com.